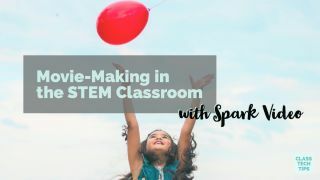 If you’re looking for new ways for students to show off what they have learned, consider introducing a STEM activity with Spark Video. With this dynamic creation tool, students can use their voice to record what they have learned about a topic. They can snap pictures or search for images to create a product ready to share with their peers, family, or the world! Do your students show their work when solving math problems? Have students create a screen recording using a screencasting tool. Then students can add narration, music, and text to their video. They can share this video on a school YouTube page or with their classmates. Instead of a lab report, have students create a video about a science experiment. First, have them snap a picture that represents each part of the scientific method. Then, they can record their voice to explain each step. Ask students to add icons to their video to represent significant moments of their experiment. Getting ready for Hour of Code? Students can create a video where they capture their goals for learning how to code. This video could feature the steps they will take to practice coding, or the end product they would like to create. Students can include this video and a companion video in their end-of-year portfolio to chronicle their journey. You may have heard the news this month on the new resources from Adobe Spark. They have set up a website for educators, full of classroom ideas. On this website, you’ll find a handful of activities perfect for cross-curricular, math, and science activities. When creating movies in your classroom, your task could vary greatly. I recommend making an exemplar to share with students. This way you can become familiar with the tool and demonstrate to students what the final product will look like. If you haven’t used Spark Video before, it is a powerful movie-making tool for students and users of all ages. To create a Spark Video, you can use Google single sign-on or your email to make a new account. Using the iOS app or your web browser, all you need is an idea to get started! Once you open up a new project, there are a few choices you can make. You can change the size of the video from widescreen to square, and choose a theme. In addition to these choices, every video can include music in the background – or you can upload your own music. Spark Video is a user-friendly tool where the “plus sign” lets you add new slides and content to each slide. You can play with the layout as you add images, video, icons, text, and voice to each slide. After students have finished their video, they can download it as a file or share it on the web. If students publish it online, they can share their link in Google Classroom, post the link in Flipgrid, or even connect it to a QR code. Creating a video in the STEM classroom is a great way to get students talking about their learning! When students create a movie on any topic (within any subject area) it is essential they have a plan. I created a set of graphic organizers you can use with your students. These are customizable for a wide range of projects, including ones that focus on STEM topics. If you’re considering including movie-making in your classroom, don’t get rid of rubrics you’ve used in the past. Instead, add a section that includes some of your new expectations. Your rubric might now include (1) setting the tone with music, (2) choosing symbols to represent information, (3) establishing a clear call to action, (or) another expectation you have for students. In this list I include a bunch of favorites for teachers, including low-cost headphones. You might ask students to use headphones they carry in their pocket or ask for donations of headphones with microphones on the cord. If you tied the earbuds together or cover them with electrical tape, students can just use the microphone. Combined with a clothespin it becomes an instant lapel microphone! Are you reading to introduce movie-making into the STEM classroom? Use Spark Video this year to help students tell the story of their learning in every subject area!